The teaching of naturalistic evolution permeates many facets of our society and is accepted as a veritable fact by a majority of the masses. Critics of Darwin's doctrine are often branded as uneducated, unintellectual, and scientifically irrelevant. In recent years, however, and largely based on the intelligent design movement, the ideas of evolution's opponents have received greater dissemination and notoriety. As a result, many individuals have been awakened to the inconsistencies, contradictions, and pseudo-science underlying the teaching of macro evolution and have renounced the doctrine of neo-darwinism. This list includes individuals from the highest tiers of scientific scholarship, research, and academia. The responding backlash among Darwin's naturalistic proponents are often vitriolic attempts to undermine creationists who have discredited their endangered arguments, once thought to be impregnable. Unraveling Evolution explores the doctrine from a biblical, scientific, and cultural examination of the evidence. 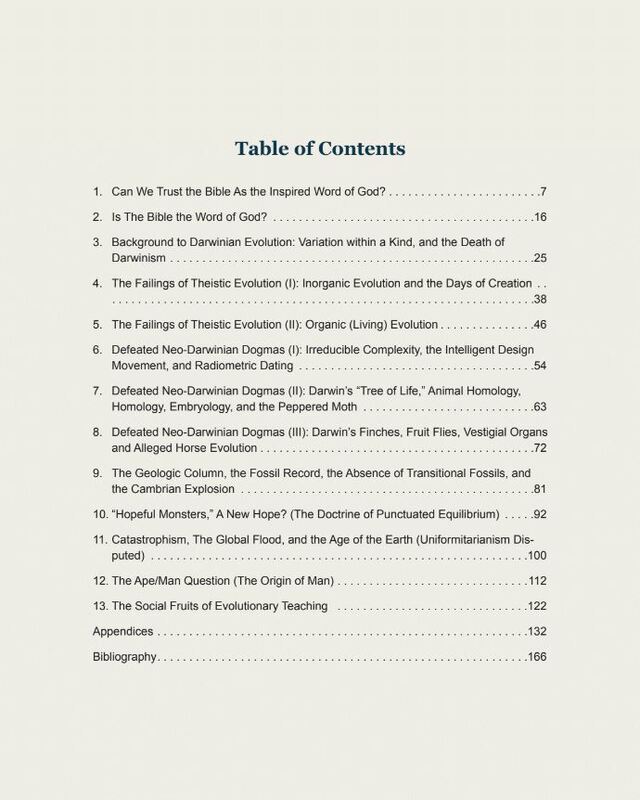 This work provides readers with an overview of the major features and failings of the doctrine of naturalistic evolution, as well as a critique of current attempts to couple aspects of the theory with biblical theology. Readers will come away with a better understanding of the controversy and a heightened readiness to respond to evolutionary ideology. Unraveling Evolution (revised second edition) by microbiologist Joshua Gurtler explores the important issue of macroevolution. As a scientist and Bible believer, Gurtler challenges the validity of this theory so widely accepted in today’s world. This excellent study offers understandable evidence and argumentation suitable for High School students as well as detailed information in the 13 lessons and 12 appendices to broaden the understanding of adults and college students. Lessons 1 and 2 ask the questions, “Can we trust the Bible as the inspired word of God?” and “Is the Bible the Word of God?” Lesson 3 gives the background to Darwinian Evolution, considering variation within a kind, leading to the death of Darwinism. Lessons 4 and 5 consider the failings of (so-called) Theistic Evolution. Lessons 6-8 address defeated Neo-Darwinian dogmas. Lesson 9 looks at the geologic column, the fossil record, the absence of transitional fossils, and the phenomenon known as the Cambrian Explosion. Lesson 10 considers the theory known as Punctuated Equilibrium. Lesson 11 disputes the theory of Uniformitarianism—the foundation of much of Darwinian theory. Lesson 12 addresses the origin of man, and lesson 13 ends by pointing out the social fruits of evolutionary teaching. The appendices offer charts documenting assertions made in the text, articles exploring specific topics in depth, and quotes from scientists regarding issues explored in the text. The bibliography fully documents all sources cited in the book, allowing the reader to confirm and further study this vital subject. The following book review may be dry and dull, but the book reviewed is not. The book is vivid, challenging and rich. You will not regret reading it! We have gathered material over the years about evidences and evolution, but as good as those things were, none of them can compare with Joshua Gurtler’s Unraveling Evolution. The contents are so comprehensive that they are almost an encyclopedia on the subject. The writing is concise and well organized, leading the reader through each topic in a logical progression. Scanning the five page bibliography gives a glimpse into how throughly the author has researched his work. There are thirteen chapters, each illuminated by a variety of graphics placed within the text discussing them. Gurtler has a flair for bringing each topic to life by the quality of the evidence he has chosen, whether that evidence consists of scientific facts or the numerous documented quotes he has included. A page or so of challenging questions ends each chapter, highlighted by a practical question for answering unbelievers or critics. Students of these things will find some familiar topics like Ernst Haeckel’s faked development of embryo studies enriched with details of background. Sources from this millennium negate the old ploy of evolutionists that “more data” will prove their interpretation of science. I was particularly struck with the twelve very specific challenges to Uniformitarianism in Lesson 11 and a very telling quote from Aldous Huxley in Lesson 13. “We objected to morality because it interfered with our sexual freedom.” So much for objectivity. Much attention is given to the practical results in everyday life of fully implementing atheistic principles. Unraveling Evolution is not an easy read, but it is a rewarding one. As Buddy Payne has said, the Christian has no reason to fear from learning about true science. Quick view Out of stock. Call 855-492-6657 for details and options.